Ah summer! I love this season of picnics and barbeques. In fact, we’re having a McG family celebration tomorrow, and I’ve been asked to bring my Mac & Cheese. Some of you might find this recipe a bit heavy for a hot day. Never fear! I’ve got a refreshing, light dish for you. This Citrusy Corn Salad is the perfect side to a burger or rack of ribs. I also think it’s amazing served on top of grilled fish. 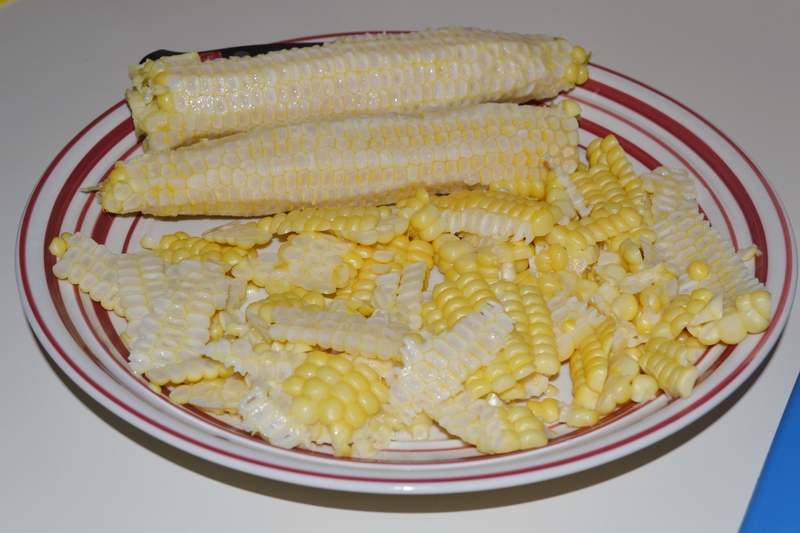 Clean and cook 2 ears of corn in salted boiling water for 2-3 minutes. I like a firmer kernel, so feel free to cook your corn a bit longer if need be. Ta-da! That’s it! You are finished with the stove. Take a knife and run it down the side of each cob to cut off the kernels. You should have honey comb-like wedges as seen in the picture above. Separate the kernels and transfer to a bowl. Next take out your trusty cutting board and chop 8-10 tomatoes into quarters. You’ll probably feel like a giant, but I think this is the perfect size to give another texture and some color to the dish. Afterwards, zest a lime and then add the juice. Add the salt and pepper and stir. Here’s the point where I’ll lose some of you. Wait-come back! Just hear me out. I love cilantro and think it’s the perfect accent to the fresh citrus of the lime and sweetness of the corn and tomatoes. I recommend you add a tbs of chopped fresh cilantro to the salad to finish things off. I recognize that cilantro can be a polarizing herb (sorry Dad and Apres), but I like it so go on and add it. 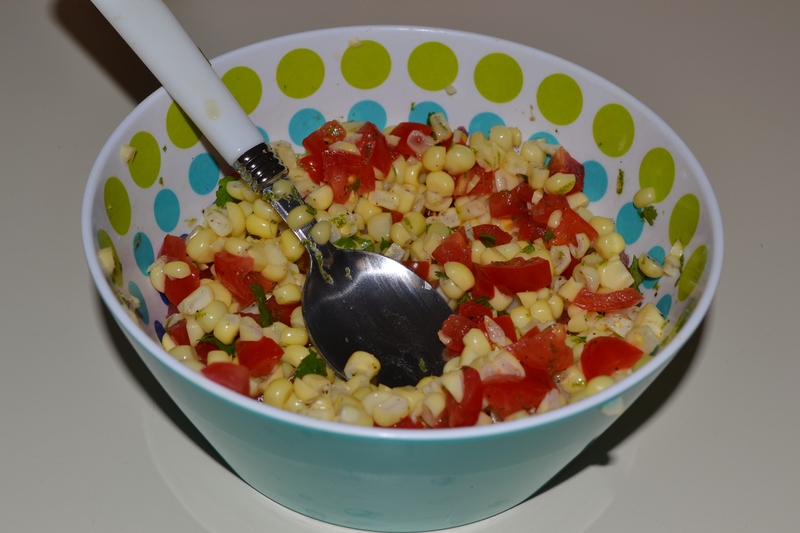 Now transfer your corn salad to a brightly colored bowl and pop in the fridge. This can sit in there for a few hours, and this will allow the flavors to blend. Now go grab a beer and get back to your party! Still feeling overloaded and bloated after all of the Thanksgiving indulgences? Me too! What if I said the three magic words? Quick, fresh and simple. Oh, and what if I threw in healthy, for good measure. Now we’re talking right?! Set out two plates with two taco shells each. 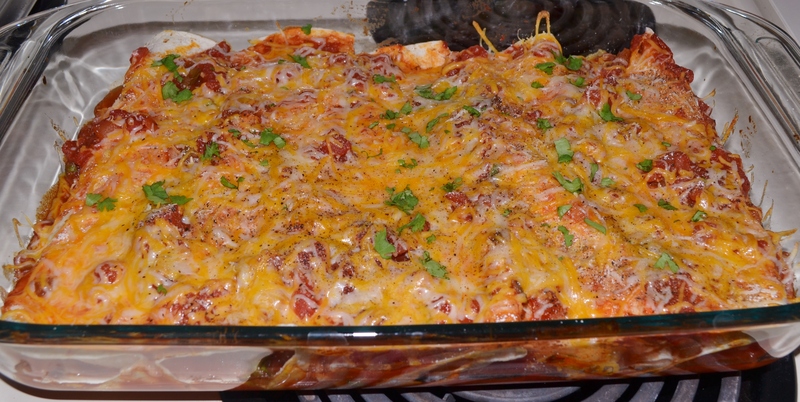 Divide your cheddar cheese and greens evenly into the four shells. 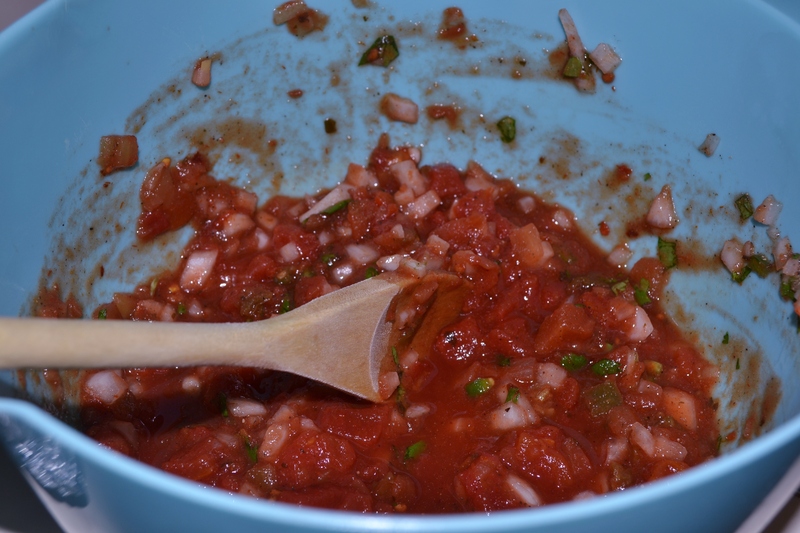 Then chop up your tomatoes, jalapeno, and cilantro. Set aside. In a large bowl combine olive oil, garlic, tomato paste, and the juice and zest of your limes and lemons. Mix and then add shrimp, gently mix shrimp and sauce together. Season with a sprinkle of salt and pepper. Heat a pan over medium heat and pour in half of the bowl of shrimp. Spread out shrimp in the pan so they cook evenly. These little guys cook up very quickly, and will be finished when their tails curl in and they take on a light orangy-pink color (see the image above). I find these usually take 1 and 1/2 minutes per side. 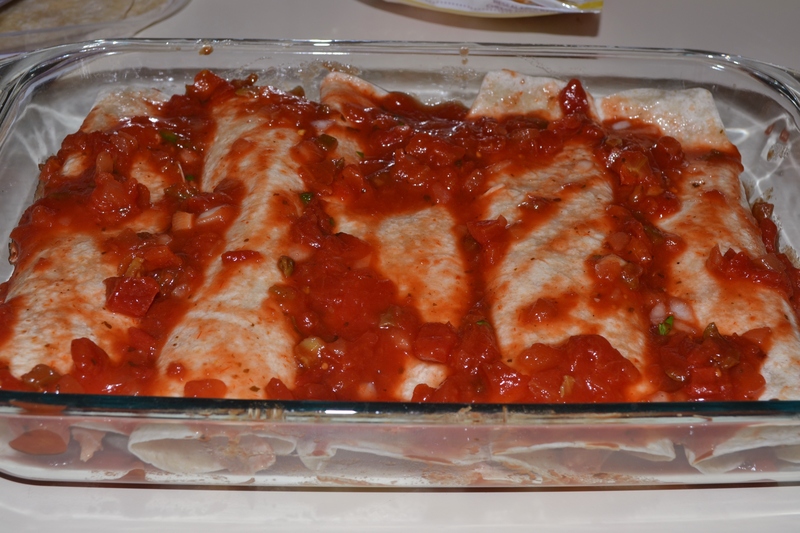 Once your first batch is cooked, transfer them to the first two taco shells. 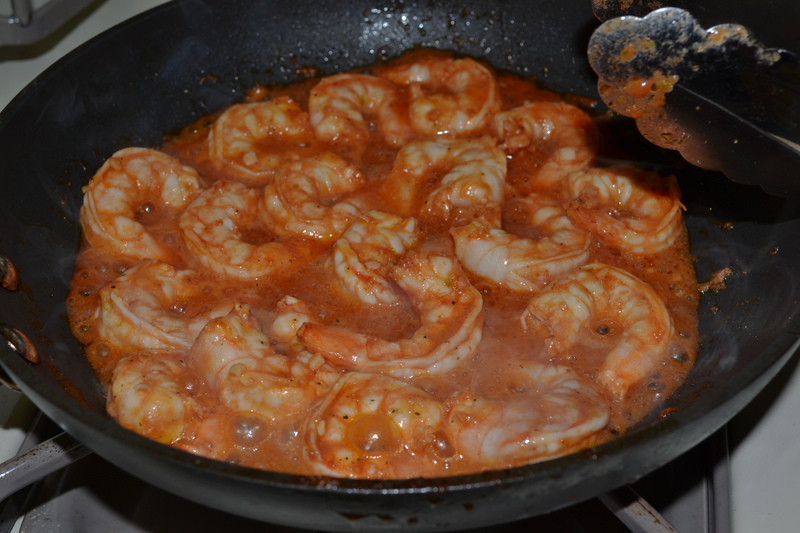 Pour the sauce they cooked in over the top of the shrimp, and then use the same pan to cook second half of shrimp. Once completed, transfer second batch of the shrimp to the last two taco shells. Top shrimp tacos with tomatoes, jalapeno and cilantro. If desired, add salsa to the top of each taco. Now that’s, whats for dinner! My tacos were delish! I did have one misstep in the kitchen though. 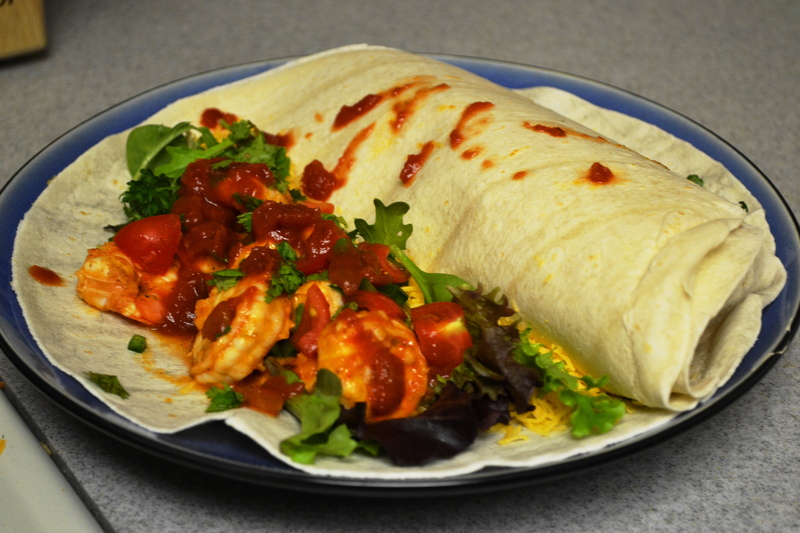 I decided to assemble everything in tortillas (see image above) since I tend to prefer soft tacos. Bad idea! My tacos fell apart right away and were soggy yet delicious. I recommend using the hard shells for these tacos. Otherwise these are a hit!